"A peer to peer application for downloading various types of media content." A peer to peer (P2P) file sharing networking application, Soukseek is used mostly to exchange music with other users, however users are able to share a variety of files that they so choose. With SoulSeek, you will be able to download videos, music, documents and other media files that you are interested in over a peer to peer connection using this simple to use application. It is possible to see the connected users that you are downloading content from at that very moment which gives more you possibilities of finding what you are looking for. We will also be able to see, with a variety of details, the files that are being downloaded, specify the number of simultaneous downloads, and the download speed needed. You will not be restricted in having control over the connections this application makes to download the content you want. You can configure all of these settings while using the software to make sure you connect to the sources you want and not the sources you don't want. In other words, you can block IPs that you connect to that you might be aware are not safe or you have received infected files from before. This ensures you have full control over your connections and the safety of your personal computer. There is also an option of creating a block users list which you can modify to suit your needs. This makes sure possible infected users won't be able to connect to your personal computer to receive any of your files or vice versa at that very moment or in the future while you use the application. We can also chat with the users that we know or talk to a person while we are downloading some of their files. So, Soulseek can also be used to communicate to other users of the application that you either may know or for other reasons. You also have the ability to add a description of yourself while using Soulseek to identify yourself to others if you wish. Most of the time this seems to get used as a way of being funny while using the application rather than other people identifying themselves. It also is commonly used as a way of advertising the types of files they have uploaded. 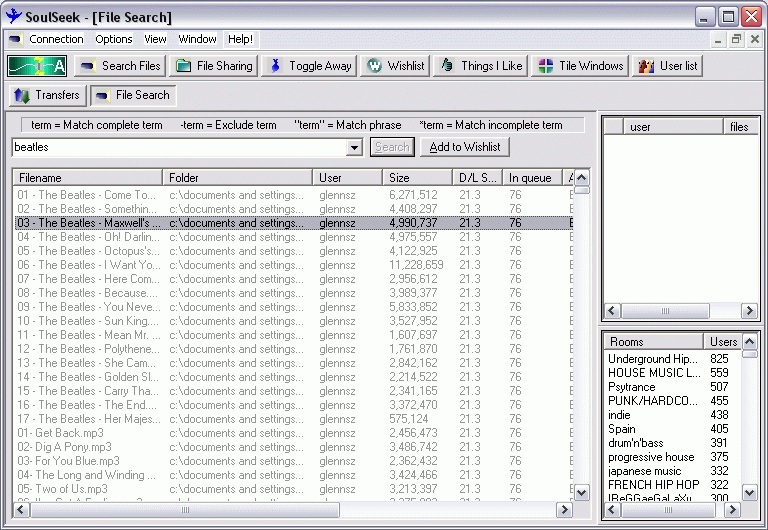 This also allows you to find the content you wish to find much easier so you aren't searching for the stuff you want for ages. So with Soulseek, we've got community, good control over the safety of your personal computer, and a load of content to choose from all from this simple to use application. That makes Soulseek something to definitely try if you are a common user of peer to peer applications.